Home » News » Extra Special Wino & Conny Ochs Boxset Coming Soon! Extra Special Wino & Conny Ochs Boxset Coming Soon! Exile On Mainstream just can’t stay away from the wooden boxes, and there’s a new release on the way in what is quickly becoming a bit of a tradition. 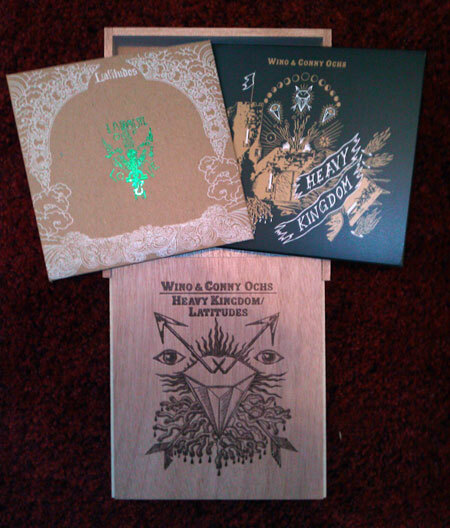 They’ve teamed up with the lovely folks at Southern Records and bundled up Wino & Conny Ochs’ fantastic new album Heavy Kingdom (Ollie’s review can be read here) and the soon-to-be-released Latitudes session Labour Of Love for a nice and SUPER-ULTRA-LIMITED wooden box edition. Only 300 made!!! Wino and Conny Ochs’ tour is well underway, now watch this superb video below filmed in Mutišov, Czech which gives you a real sense of the chemistry between the two! The UK leg of the tour is also fast approaching, the dates & flyer for which you can viewed below.